Tax planning for the salaried employees is a matter of planning and discipline. Planning involves making a set of decisions at the start of the financial year and discipline comes in when you are required to adhere to the plan come what may. Irrespective of whether it is your first job or whether you have conquered the corner office, income-tax duly deducted from your monthly salary pinches. The key CTC components which could help reduce your tax liability and boost your take home pay are outlined below. These apply to all non-government employees. HRA is the most common CTC component. Those staying in rented accommodation can avail of an exemption against the HRA received and only the balance would be taxable. The exemption is limited to (a) rent paid less 10% of basic salary or (b) 50% of basic salary where the house is situated in any of the four cities of Delhi, Mumbai, Kolkata or Chennai, and 40% of basic salary in other cities or (c) actual HRA received, whichever is the lowest. If your CTC doesn't contain an HRA component, deduction for rent paid is available from gross taxable income, subject to various limits (maximum deduction Rs 5,000 per month or Rs 60,000 per annum). For claiming HRA exemption, if your annual rent exceeds Rs 1 lakh, you should obtain not just the rental receipts but a copy of your landlord's PAN card for submission to your accounts department. Your annual holiday within India can get you a tax break. The tax exemption on any reimbursement of your travel expense while on leave is limited to the economy class air fare for the shortest route available to your vacation destination. No exemption is available for expenses such as hotel, local conveyance, etc. Keep the travel bill handy to submit to your accounts department to claim the exemption. LTC is allowed to you as a salaried employee in respect of two journeys performed in a block of four calendar years. The current block of four years commenced on January 1, 2014. So if you haven't taken that much-needed break last year, do so now. Keep proper tabs, retain relevant travel bills and claim your LTC. Your travel expenses for a holiday abroad are not eligible for a tax break. If you are planning a long vacation covering destinations in India as well as a foreign country with one air-ticket, the tax man may not allow a tax break even for your cost of journey within India. Medical Allowance is levied up to Rs.15,000 provided all bills for the same are furnished by the employees to the employer. For conveyance allowance to be made tax free you need to do nothing to prove. Attending work is good enough we guess! You can plan to maximize your tax savings and reduce income tax liability by availing the benefit of provisions relating to deduction from taxable income under various sections of Income Tax Act. The maximum tax exemption limit under Section 80C has been retained as Rs 1.5 Lakh only. The various investment avenues or expenses that can be claimed as tax deductions under section 80C are as Insurance, PPF, Mutual Funds, 5 years Tax saving Deposits, Tuition Fees, Housing loan repayments Etc. Contribution to annuity plan of Life Insurance Company for receiving pension from the fund is considered for tax benefit. The maximum allowable Tax deduction under this section is Rs 1.5 Lakh. Employee can contribute to Government notified Pension Schemes (like National Pension Scheme – NPS). The contributions can be upto 10% of the salary (or) Gross Income and Rs 50,000 additional tax benefit u/s 80CCD (1b) was proposed in Budget 2015. Kindly note that the Total Deduction under section 80C, 80CCC and 80CCD(1) together cannot exceed Rs 1,50,000 for the financial year 2016-17. The additional tax deduction of Rs 50,000 u/s 80CCD (1b) is over and above this Rs 1.5 Lakh limit. Deduction u/s 80D on health insurance premium is Rs 25,000. For Senior Citizens it is Rs 30,000. 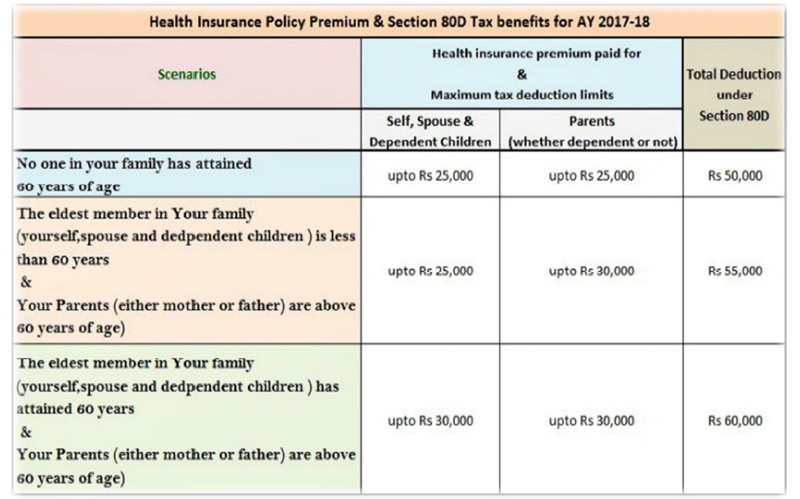 For very senior citizen above the age of 80 years who are not eligible to take health insurance, deduction is allowed for Rs 30,000 toward medical expenditure. Preventive health checkup (Medical checkups) expenses to the extent of Rs 5,000/- per family can be claimed as tax deductions. Remember, this is not over and above the individual limits as explained above. (Family includes: Self, spouse, dependent children and parents). 1. The home loan should have been sanctioned in FY 2016-17. 2. Loan amount should be less than Rs 35 Lakh. 4. The home buyer should not have any other existing residential house in his name. As per the budget 2016 proposal, the Tax Deduction amount under 80GG has been increased from Rs 24,000 per annum to Rs 60,000 per annum. Section 80GG is applicable for all those individuals who do not own a residential house & do not receive HRA (House Rent Allowance). It is prudent to avoid last minute tax planning. Do not invest in unwanted life insurance policies or in any other financial products just to save taxes. It is better you plan your taxes based on your financial goals at the beginning of the Financial Year itself. Plan your taxes now, instead of waiting until late December 2016 (or) January 2017. Also, kindly understand the tax treatment of the selected investment products across the different investment stages (i.e., investment, accrual & withdrawal) and then invest. I believe that the above list is useful for your Tax Planning purposes. The above ‘Income Tax Deductions 2016-17’ are applicable for financial year 2016-2017 (Assessment Year 2017-2018). The above stated exemptions/deductions for salaried employees are the most useful exemptions. However, there are various other exemptions as well but are not commonly used. It's very important that you know where your salary is going. At the end of the day it's about finding the right investment for your moneys worth. Don't be like the people from Essaylab review who wasted so much money and effort but ended up penniless.